Did you know that $550B is lost every year in lost productivity associated with the high percentage of disengaged employees? No startup can afford to lose out on that much cash, especially since the solution is so simple. Do a little research on the top startups to work for, and you’ll find that just about all of them implement intensive programs designed to maintain company culture and employee engagement. That’s not a coincidence — with the increasingly competitive market for talent in the startup world, the best of the best are naturally attracted to the coolest agencies. Officevibe, a Montreal-based startup, makes it their mission to improve company culture by providing a fun, productive atmosphere that caters to the strengths and motivations of each and every employee. The business is run by a group of young entrepreneurs who looked at trends in top companies to work for and used the results to come up with their own unique approach. Officevibe is a software-as-a-service platform that companies implement in their offices. On a daily or weekly basis, they release new challenges and content that promote employee engagement in the workplace. When an employee completes a task, they’re rewarded with points that can be redeemed for various prizes. The platform is available online, and also comes with an app that’s compatible with virtually any major smartphone or tablet. If you want a walk-through demo of how it works, check this out. Wellness. 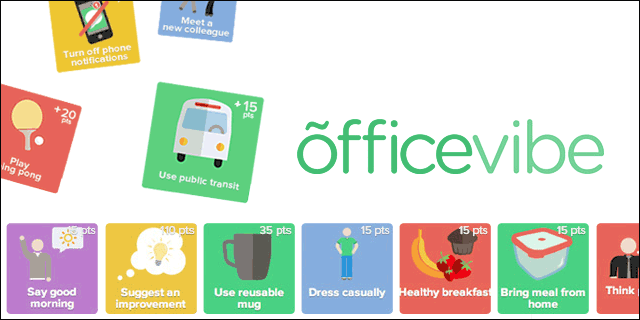 Officevibe uses fun challenges to encourage healthier, physically active employees. Productivity. In order to keep performance levels high, the platform lets workers easily collaborate, and encourages them to excel in their position. Social. The challenges Officevibe offers give employees the chance to become closer to each other. Environment. To promote a greener office, the platform offers tasks that keep employees environmentally-conscious and clean. Generosity. Officevibe encourages users to give back through kind acts in both the office and community. Officevibe is sure to make a difference in your startup, no matter the size. The unique and fun challenges can motivate even the most apathetic employees, and the culture is sure to improve. The platform can be a great tool to ultimately attract/cultivate and retain top talent through improvement of workplace atmosphere and employee engagement. With a VPN, you can remain anonymous online, as you traffic is routed through servers that can't be attributed to you. You can get a VPN by buying a subscription, and Black Friday is a great time to grab a bargain for the whole year. We look at the best deals. On Wednesday morning, House Democrats introduced the Save the Internet Act, a bill that would repeal the FCC vote from late 2017 that did away net neutrality laws. Here's everything you need to know about the bill.